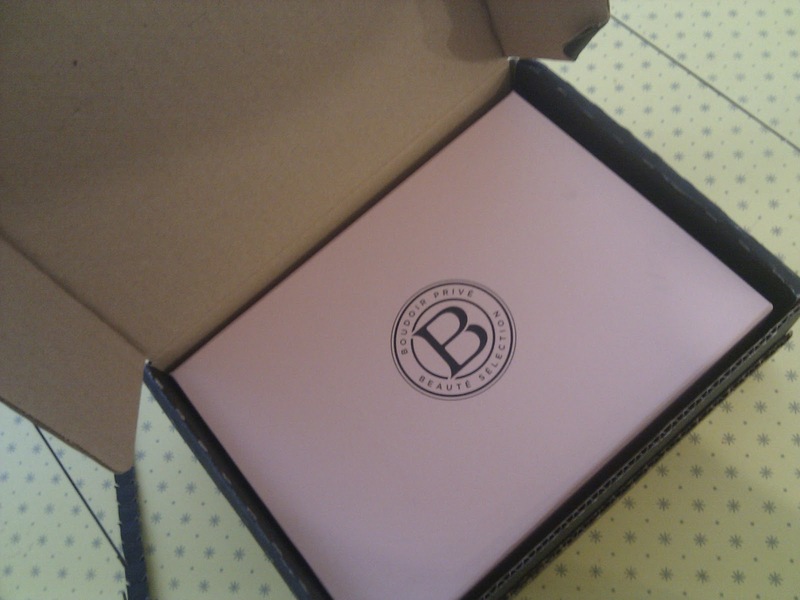 My Boudoir Privé box arrived on Saturday but due to major sickyness I only went to the post depot to collect it today! Before this I read some really negative comments on the BP Facebook Page and it was starting to irritate me slightly that everyone is so quick to complain but never so quick to say something nice about what they did like in the box! After posting a wall post on there though to ask what peoples’ favourite product in the box was there was a few more positive comments flying around. 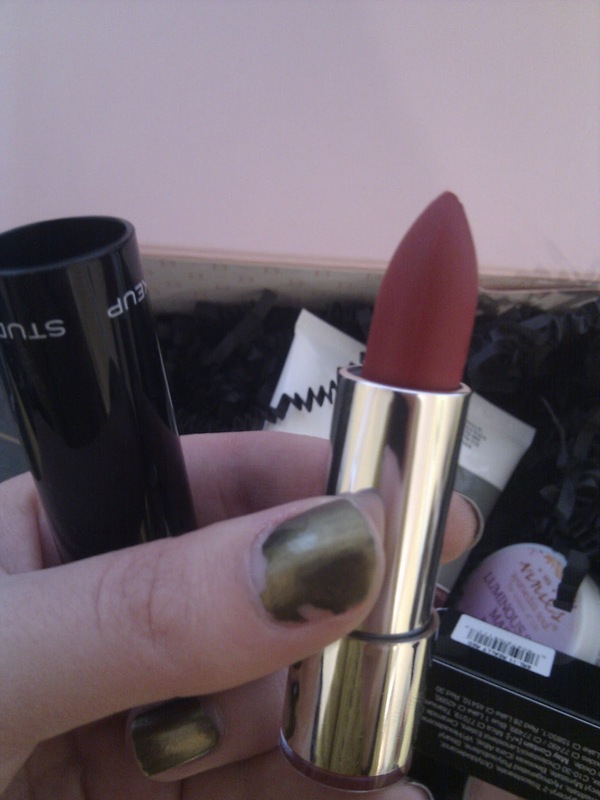 The lipstick seemed to be the overall fave in this months box. I also don’t get why a lot of more ‘popular’ bloggers seem to really slag off BP too, it’s not very nice to focus on the bad things all the time, all these beauty box services are relatively new so there’s going to be teething errors, has anyone been 100% satisfied with any on the market?!?! ……/rant! It’s a ‘sample’ box after all….. Anyway. As usual it came in a nice, well presented package…. 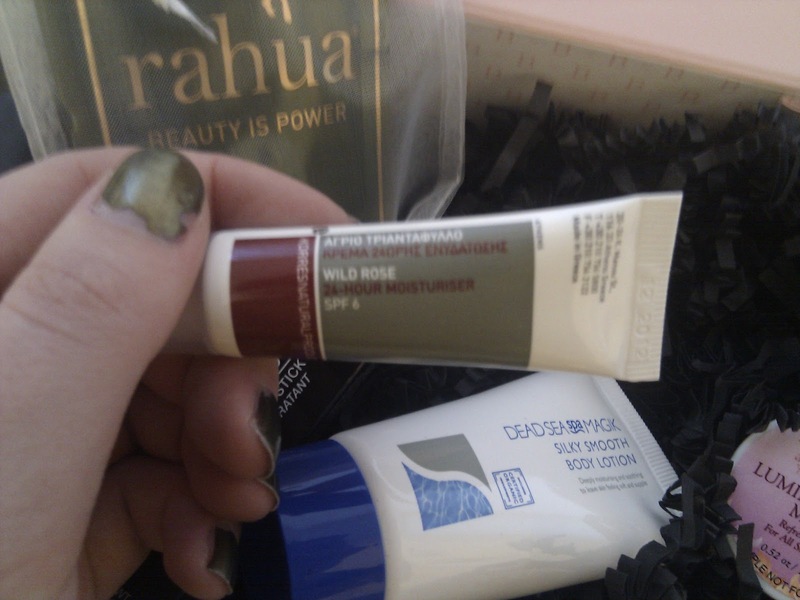 I do think the box is slightly too ‘pink’ for my taste but hey… it’s a box….. ha. I’m liking how they’ve started to include little quotes like this on the leaflet, its a nice extra touch I think…. There were 6 items in the box this time, including 2 lots of a face mask (the one thats been causing a stir online) I’ve not tried it on my face yet but I have done a patch test on my arm and had no reaction, when I try it I will post on their facebook page the outcome! The first product which I saw on numerous other blogs that I really wanted was this Studio Make Up Rich Hydration Lipstick in the Red shade. I was really holding out for this one! I’ve wanted a red lipstick for a while but feel like I can’t get away with it so never splashed out and bought one, this has defo saved me the bother! The colour is really rich and nice but I’m not sure if I dare to go outside wearing it yet…. 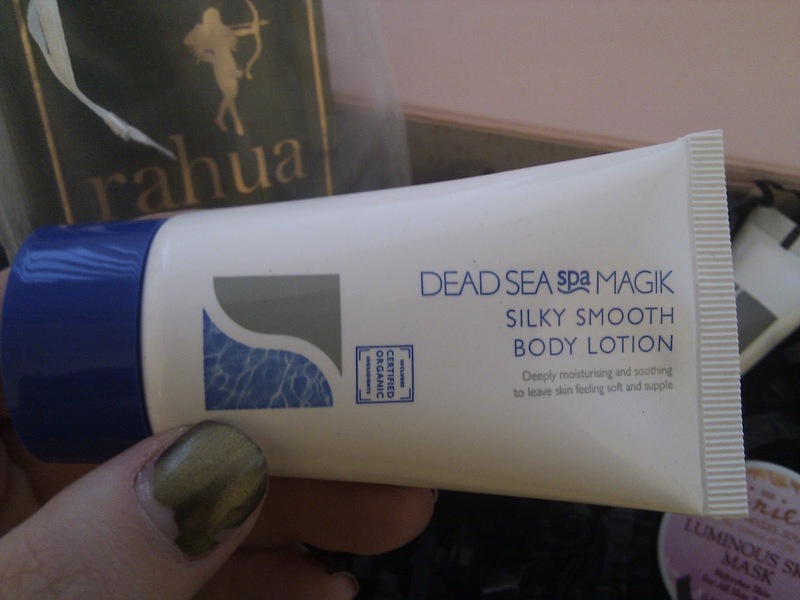 Another product I knew I’d like immediately was the Dead Sea Spa Magik body lotion, as you can never have enough moisturisers. After the disappointment of receiving the bath salts I will never use as I don’t have a bath in November’s Glossy Box this was a welcome product. The Korre’s 24 hour moisturiser is a nice size for a sample product, I still have several facial moisturisers from my previous boxes to get through so will hold off a bit to try this, but id it’s anywhere near as good as the Korre’s guava body lotion it’s going to be very welcome. 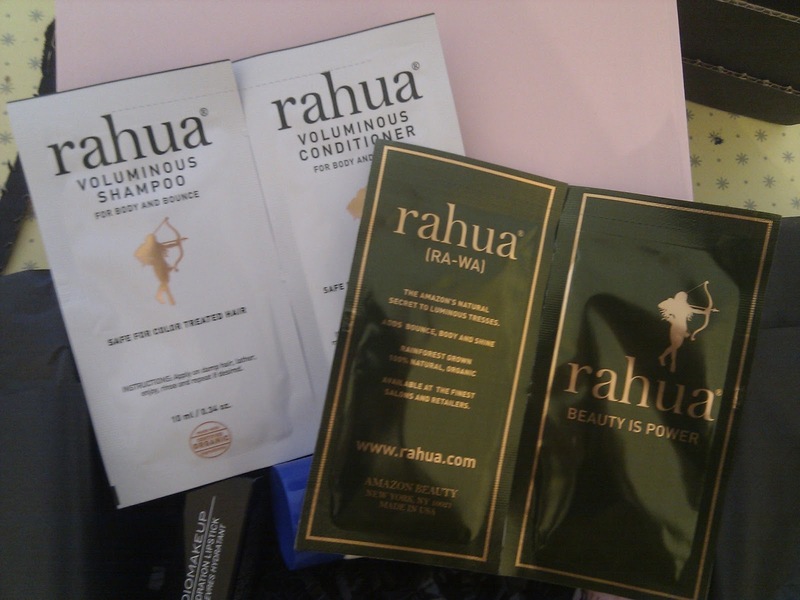 I got two lots of sample sachets for some Rahua Shampoo and Conditioner. A lot of people are saying the sachets don’t have enough in to wash their hair…. Erm… Use them both? thats probably why they put two in?!?! It was a refreshing change not to receive any perfume samples in this box! And overall I feel a lot more satisfied with this than I did Glossy Box this month. Like I have said previously, I am holding out for the December box for both to see what they pull out of the bag and then choose which box I prefer to stay subscribed too. 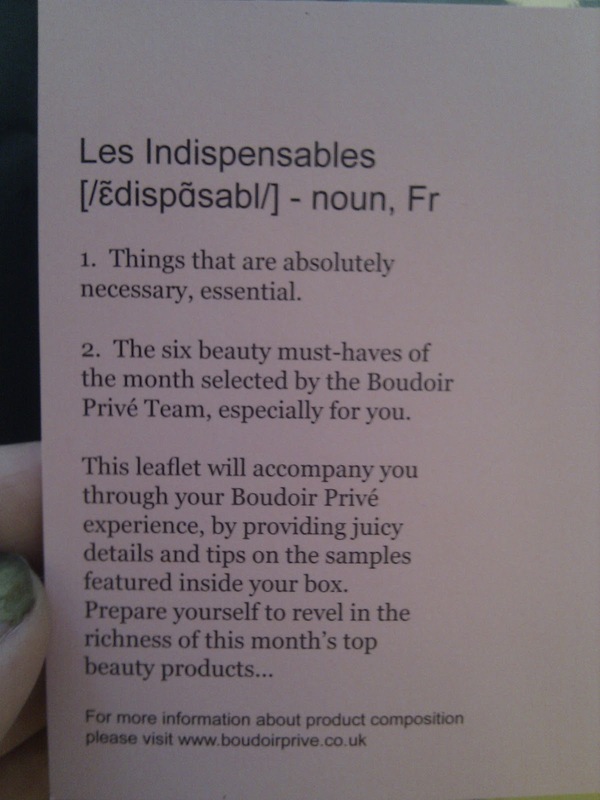 So far Boudoir Privé is the winner for me but I feel it’s catering for a slightly different audience than the Glossy Box is…. Hmmmm…..
What are your thoughts on this months box??? Previous Post Twin Peaks Chic, Revisited. Next Post Taste Sensations….Kind of.